It’s your company. Your quest for success. At Shelly NC, Inc., we are not here to change that, we’re here to partner with you to discover the most effective ways of utilizing your existing technology platform and operational processes to reach your goals. Our sophisticated product suite does not dictate how your business processes should flow. We will never ask you to adjust your operational workflows to fit our software solutions. Shelly products adapt to and optimize your existing IT infrastructure. Your IT investment is important to you and it’s equally important to us. We ensure that you won’t spend time and money on an IT system you must convince yourself is useful. The results and benefits from Shelly’s enhancements to your current operational platform will be readily apparent from the moment of implementation. Just as essential to your profitability, Shelly provides you the method to discover new revenue opportunities hidden within the data you’ve already collected. This creates a life cycle of performance and profit that is as ever-changing as your enterprise.
" Sustainability" is critical to success, yes, however it's being redefined by Millennial buyers in the global market of tomorrow. Do you know how to position your business to attract these consumers of the future? Our partnership with Ecoland brings another valuable resource to our clients who not only want to say they are sustainable, but can acquire the expert certifications and endorsements that bring an incredible advantage over your competition. Thank you for your interest in Shelly NC, Inc. If you spend just 30 minutes with me to share your biggest business challenge, I will use Shelly's visionary tools and strategies to design a viable, customized and implementable solution to optimize your business. I am passionate about helping my clients design an operational environment that is sustainable with the Millennial consumers of tomorrow. As a strategy expert, I am committed to driving my client's continuous success with recurring technology system reviews. This allows us to re-calibrate a client's Shelly-powered infrastructure, as needed, to ensure maximum performance in an ever-changing marketplace. Innovative Workflow Software overlays any operating platform (SAP, Oracle, etc) to unify operational processes and reveal new efficiencies and improvements. By synchronizing Shelly software with your existing infrastructure, you can immediately start streamlining processes, monitoring critical usage data, and making critical workflow changes. 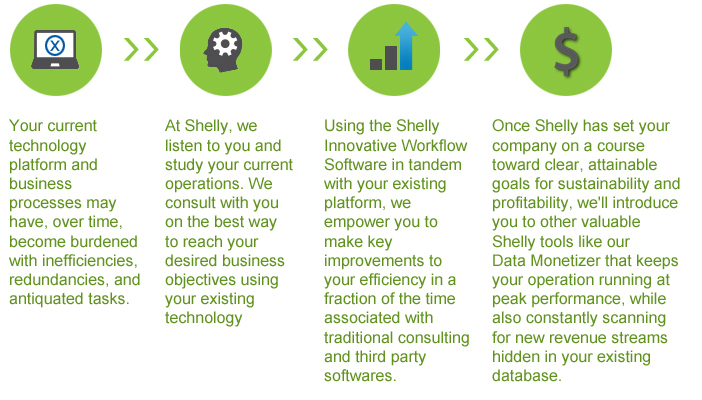 Once our Innovative Workflow Software has optimized your processes and streamlined your strategy to more quickly reach your business objectives, our Shelly Data Monetizer can repurpose all the new, robust, and valuable data you’re generating into profitable new revenue streams that constantly and automatically transform with your business. Do you have large employee base in the field? 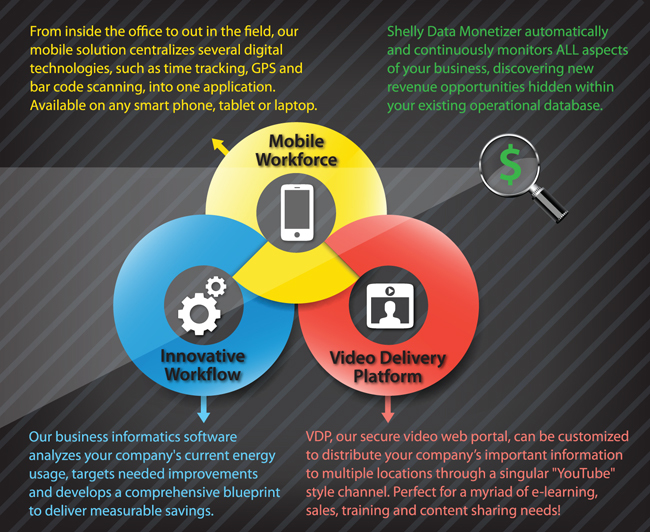 Deploy “anywhere access” to every aspect of your enterprise's data with the Shelly Mobile Workforce and communicate with your worldwide network easily via our customizable Video Delivery Platform (VDP).